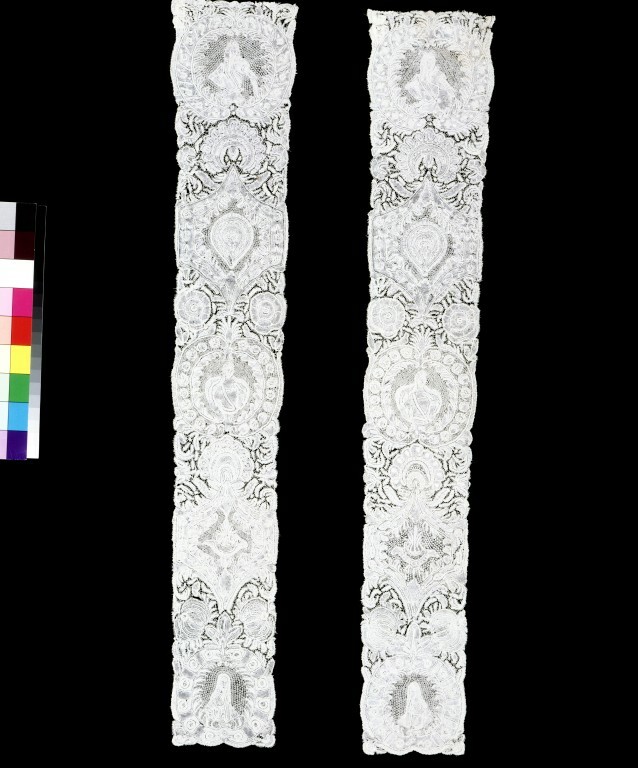 This pair of lappets would have been worn attached to a curved panel called a cap back, as part of a lace 'set' or head-dress. 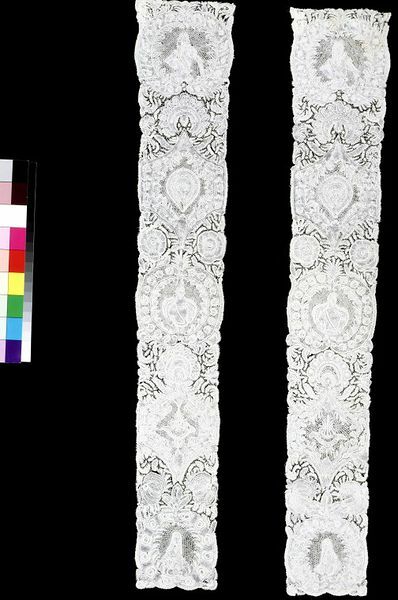 The predominant motifs in lace of this period were floral, but the portrait busts incorporated in the design of this lace reflect the similar use of figurative motifs in some contemporary French lace. They would have been based on engraved portraits. The portrait busts are enclosed within what may have been intended as laurel wreaths. The figure at the top of the lappet is dressed in armour and full bottomed wig, and probably represents the Duke of Marlborough, the female figure in the middle representing the Duchess. John Churchill, 1st Duke of Marlborough (1650-1722), was appointed Captain General of British Forces and Supreme Commander of Allied Forces, following the French invasion of the Spanish Netherlands in 1701. Marlborough is considered one of the foremost strategists and military administrators in British history. His wife Sarah (1660-1744) was Lady of the Bedchamber and close companion to Queen Anne (1665-1714). Pair of lappets of bobbin lace worked in linen thread. Square ended and narrowing slightly from top to bottom. They were worked as part lace in cloth and half stitch with raised woven edgings. The decorative meshes used as fillings are types of peacock's eye. In some areas the pattern pieces are linked by short plaited bars. From the different density in the mesh grounds of the two pieces it seems likely that at least two different workers made them. The lappets are fairly densely patterned with three portrait busts on each - man, woman and man. Each bust is within a circular cartouche that may represent (debased) laurel wreaths. The figure at the top of each lappet, which approximately match, is dressed in armour and in full bottomed wig, and may represent someone in the Marlborough campaign, possibly Marlborough himself. The female figure in the middle may represent the Duchess. The male figure below appears to be in fashionable rather than military dress. Between the portraits are loosely-defined fountain-like and scrolling shapes, and pairs of assorted flowers, fruit and leaves. Purchased. Registered File number 1989/485. 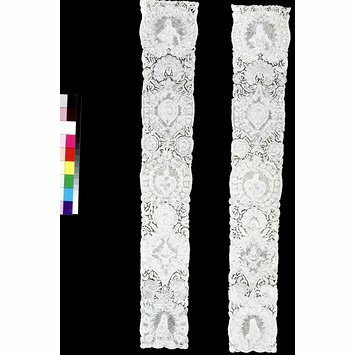 These lappets belong to a very small group of figured laces that seem to have been produced in England in the 18th century.